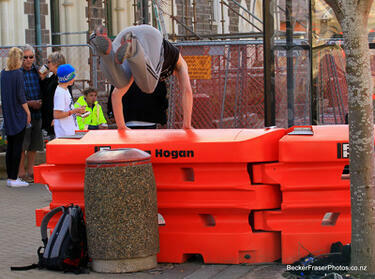 Photograph captioned by BeckerFraserPhotos, "Athletes perform on the barriers outside the Canterbury Museum". 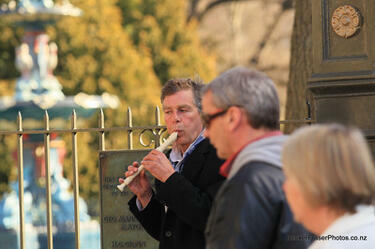 Photograph captioned by BeckerFraserPhotos, "This man was often outside the Canterbury Museum playing the recorder". 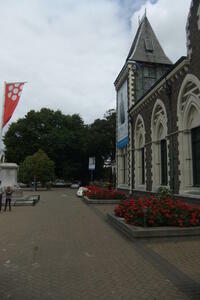 Photograph captioned by BeckerFraserPhotos, "Canterbury Museum". 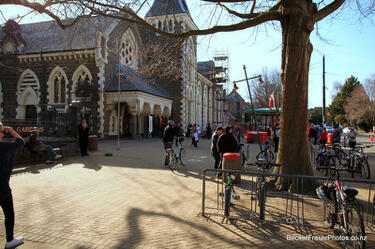 Photograph captioned by BeckerFraserPhotos, "Outside the Canterbury Museum". 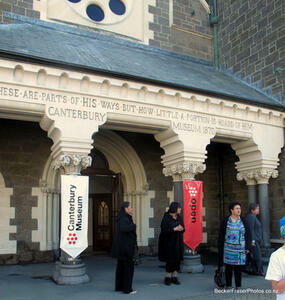 Photograph captioned by BeckerFraserPhotos, "Canterbury Museum re-opened to the public on the 1st anniversary of the September earthquake, 4 September, 2011". 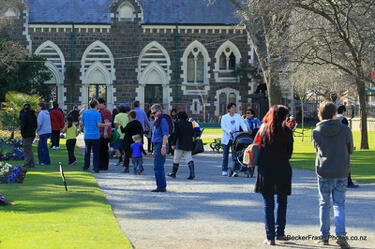 Photograph captioned by BeckerFraserPhotos, "People gathering in the Botanical Gardens for The Big Hug". 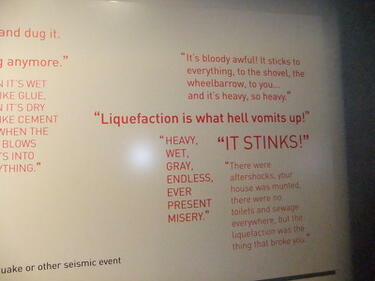 A photograph of a sign in the Canterbury Quakes exhibition at the Canterbury Museum. 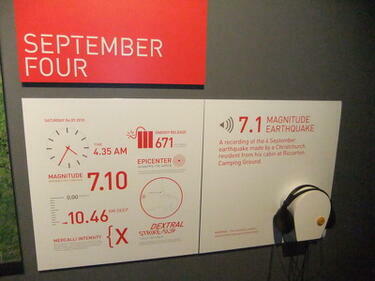 The sign displays information about the 4 September 2010 earthquake. A photograph of an exhibition sign next to the 'Quilt for Christchurch', in the Canterbury Quakes exhibition at the Canterbury Museum. The quilt was created by members of the public who sent squares to The Breeze radio station in Auckland. 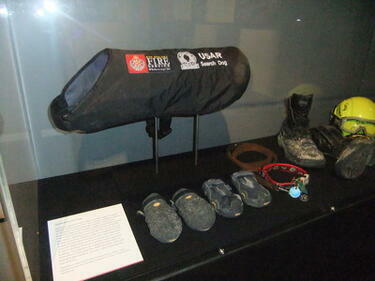 A photograph of equipment from the New Zealand Fire Service Urban Search and Rescue team on display in the Canterbury Quakes exhibition at the Canterbury Museum. 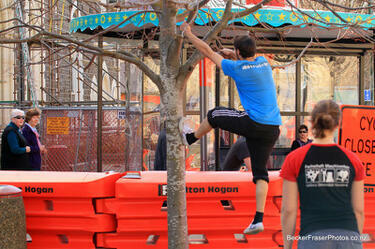 The equipment was used during the emergency response to the 22 February 2011 earthquake. A photograph of an exhibition sign next to the Speaker's Chair on display in the Canterbury Quakes exhibition at the Canterbury Museum. 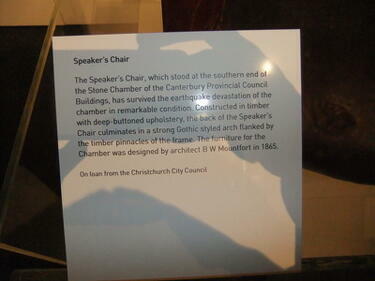 The Speaker's Chair stood at the southern end of the Stone Chamber of the Canterbury Provincial Chambers, and survived the 22 February 2011 earthquake despite the damage to the chamber. 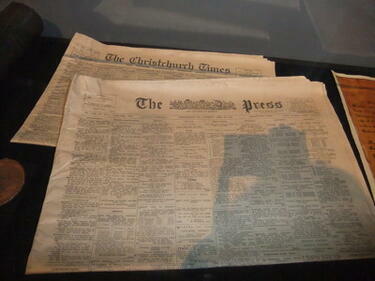 A photograph of The Press newspapers on display in the Canterbury Quakes exhibition at the Canterbury Museum. 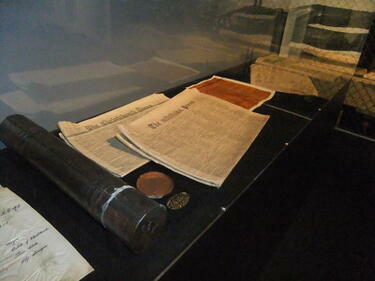 The newspapers where discovered inside a time capsule found in the plinth of the statue of John Robert Godley in Cathedral Square after the 22 February 2011 earthquake. 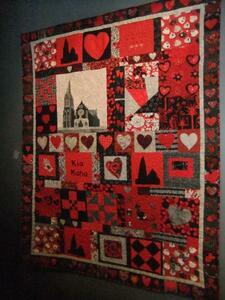 A photograph of a quilt on display in the Canterbury Quakes exhibition at the Canterbury Museum. 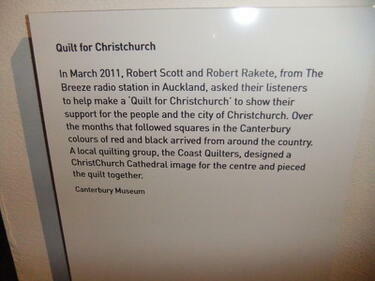 The quilt was created by members of the public who sent squares to The Breeze radio station in Auckland to be part of the 'Quilt for Christchurch'. 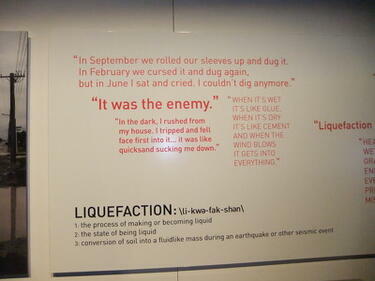 A photograph of a sign in the Canterbury Quakes exhibition at the Canterbury Museum. 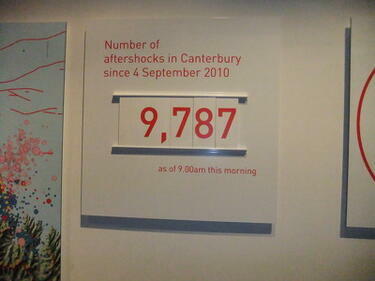 The sign displays the number of aftershocks in Canterbury since the 4 September 2010 earthquake as of 9.00 am on the morning the photograph was taken. The tally was 9,787. 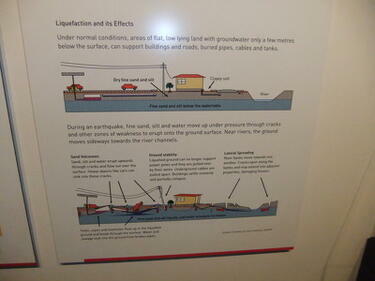 A photograph of a sign in the Canterbury Quakes exhibition at the Canterbury Museum. 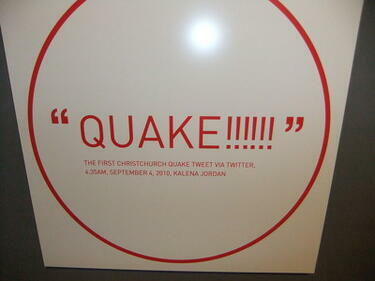 The sign displays the first Christchurch earthquake tweet on twitter, "Quake!!!!!!". 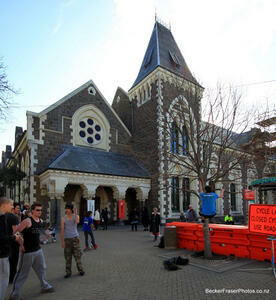 A photograph looking south along Rolleston Avenue from near the Canterbury Museum.